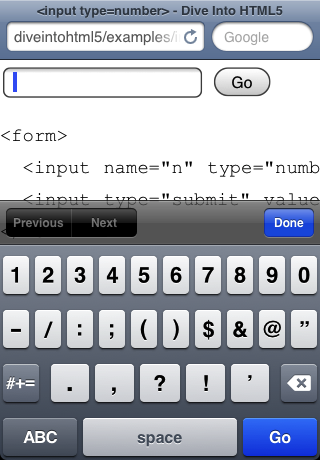 I am building a form for Mobile Web that requires users to enter in their DOB. 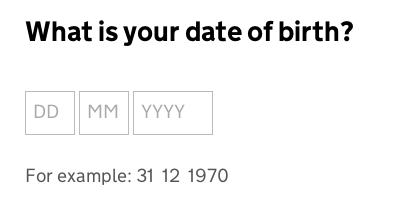 What is the best way to present the date input field(s)? Three Separate Text Fields - Users are able to enter day, month and year in three separate free text fields. With separate fields, this can cause some minor issues with users who look at the keyboard when entering data and not the screen so tended to enter in all fields then look up and notice that only the day field has been entered. Native Date Input - using to present a native-like compound menu control (see example about half way down this Smashing article on mobile form design or answers to this question (not specifically about DOB)) - I don't think this is universally supported on different mobile browsers though. Combination - Dropdowns for Day and Month (to ensure accuracy) and a free text field for Year (for faster data entry). Date Picker - Terrible option for DOB but I could present a date picker with a calendar icon where users can scroll through the months and years to select their date of birth. In my case, it is for a CRM, so speed and ease of entry are more important than 100% accuracy. I know that a simple single text field is fastest input method for most people. I am interested if the best approach for Mobile is different, as dropdown selection can be easier than text entry on Mobile. 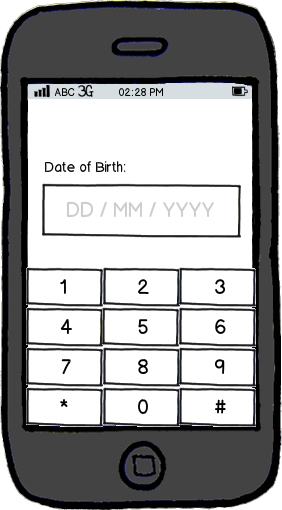 Has anyone user tested any of the above options for Date of Birth entry on Mobile Web? Bonus question: If it had to also work on Tablet and Desktop, what would you recommend? The UK site GOV.UK published some initial test findings about how users on mobile devices use a DOB field they were testing against. Initial reports suggested that having two dropdowns (one for day and one for month) followed by a text field for year was well received by users, although not exclusively. (emphasis mine). ...This tested much better, and people were able to complete this question more quickly. We also had unprompted comments from people who were pleasantly surprised to not have to deal with a long drop-down for year. Some people click a drop-down and then try to type. This does work, but it doesn’t act the same as a text input field, and is therefore confusing. For example if you type 1, then pause and type 2, you will select 2 in the list, not 12 as you would get in a text input field. The backspace key does not work. Some people had trouble interacting with even with the shorter drop-downs. Day and month both require scrolling, and we saw some people having issues with scrolling in general: knowing whether they could, and how to do that. People who struggle here often say that the value they’re looking for is not in the list. So far this has tested well, with the main issue being that some people pause and wonder whether to include a leading zero (for example ’01′ ). On touch-screen devices such as phones and tablets, we can show a numeric keyboard by using the ‘type=”number”‘ attribute. This makes the expected input clearer (a number, not a word) and makes it quick and easy to enter a number. 'In my case, it is for a CRM, so speed and ease of entry are more important than 100% accuracy'. Having three separate fields means I can allow people to type 1 or 01 into the field and treat them both as the same thing so the issue of "do I type two digits or one" is also negated to an extent. I believe that single field (with guidance) paired with the number keypad is the fastest way to input birth dates. The amount of time a user will have to scroll through or tap through things can be reduced if you just give them full control to enter it manually. They'll spend the taps they otherwise would have used on a dropdown for example, tapping the exact numbers. I feel that either single text field or three separate text field would work the best in your case of having speed over accuracy. Single text fields have their advantages because as a user I do not want have to stare at three different input fields and worry about tabbing through the inputs, however something that needs to be considered is where is the label going to be placed. In @rubysoho's example by having a placeholder the user has to remember which numbers go where, forcing the user to remember the placement of text is never good form facture. Also when using a single field I would have it so the "/" are added in after each letter combination is typed. Advantages to having three input fields is that it is very standard for most users. They expect there to always be three input fields when typing in a date or phone number. This means that no speed is sacrificed. Tabbing through input fields can be resolved by having the focus changed after the required characters are typed in. The reason we use all sorts of various forms for text fields is typically to validate the data. But these, IMHO, are all workarounds that are best handled programmatically. Assuming the app has a sense of regional differences, there's no reason that the date field can't be text and that some logic be applied to properly parse it. There's no reason that client or server side code couldn't parse those out a majority of the time. Beyond that, specifically for mobile, ideally you'd use the native date field option, as that's arguably what a user would be used to. If you can't use that, then I think it comes down to usability--which mode would be easier for a user to enter data into. The built-in date input works well on mobile and is easy to implement. It takes into account the user's locale and date preferences (e.g. using mm/dd/yyyy format for US and dd/mm/yyyy for other regions). The interface is also familiar to the user. For example on iOS it's almost exactly the same as a native app date picker. (I suspect this is also the case on Android but cannot confirm this). Not the answer you're looking for? Browse other questions tagged forms mobile mobile-web dates or ask your own question. How is the HTML5 date input type presented on different Mobile browsers?